Find out where to see the bestselling author of Children of Blood and Bone on her UK and Ireland tour in Summer 2018. Politics on the Page with Tomi Adeyemi, Alice Skinner, Karen Gregory, Sarah Shaffi, Tom Pollock & Yaba Badoe. 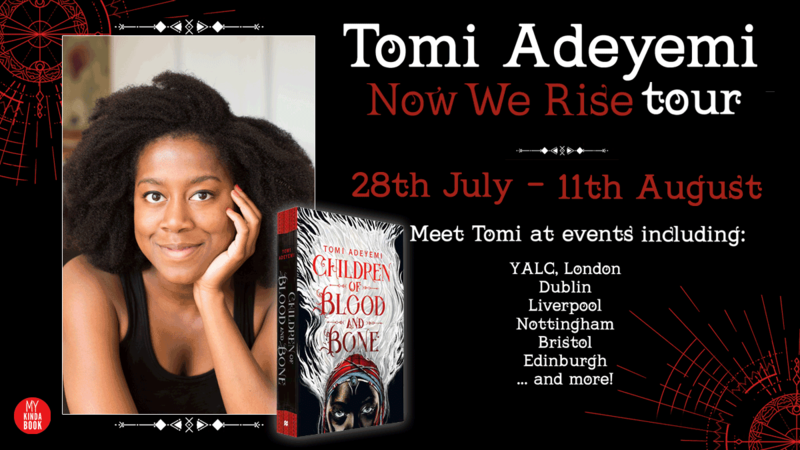 See Tomi Adeyemi and Dhonielle Clayton in conversation at Eason O'Connell St.
See Tomi Adeyemi in conversation with Aliyah Maria at Waterstones Liverpool One. See Tomi Adeyemi in conversation with Raifa Rafiq. See Tomi Adeyemi in conversation with Yomi Adegoke and Elizabeth Uviebinené (Slay In Your Lane). See Tomi Adeyemi in conversation with gal-dem editor Charlie Brinkhurst-Cuff. Children of Blood and Bone by Tomi Adeyemi is published in paperback, ebook and audiobook now.